We, humans are social beings. We feel the best when we’re surrounded by our family members, friends and the folks we’re are fond of – this is when we can be truly ourselves. It’s no wonder why a good community can be liberating and motivating at the same time. If you surround yourself with people with a positive mindset, it can help you get over any obstacle and succeed any time. And this is pretty much the case when it comes to fitness or sports in general. We’d like to show you why people tend to prefer group trainings to individual ones, and what advantages they have should they choose to join a group session. Let’s get started! Most of us entering a gym for the very first time usually have problems feeling comfortable without any help. We feel uncertain about ourselves and we are pretty unsure what exercises to do to make the very first steps on the long, bumpy road towards our goals. Doing it all by yourself is tough – but fortunately there’s a solution to help you out. Working out in a group is the perfect alternative if you want to fit in the gym community with ease. Working together helps you integrate, plus it’s a motivational force that gives you energy to push your limits and make your dreams come true even when you feel like you’re stuck. On top of that, working out with friends also provides excellent entertainment during those dreary weekdays. It’s no wonder that we’re living in the golden age of gyms and studios – you can browse through an endless list of quality services that can help you shape your body and improve your well-being. According to certain studies, people who start working out alone have a dropout percentage of 40% – and this is only within a few weeks after the first session. Naturally, there can be several reasons for this. Many people have a tight schedule and fitting in regular exercises is just not possible, while others just lose the initial spark to continue working out. The same studies, however, also discuss the positive effects of working out in a group (ie. friends or acquaintances). In this case, dropout rates drastically changes from 40% all the way down to 6%. The figures speak for themselves. They shed a light on the fact that exercising – just like any other activity – is primarily fuelled by social interaction. This is no wonder – testing your skills against others’ gives you extra motivation and helps you overcome the challenging moments. And how? By relying on simple psychology. When you are the member of a group, you aren’t just working towards your own goals. You also want to show your friends that you are an ideally working part of the whole. Thanks to this, you aren’t only experiencing success on an individual’s level, but also on the group’s level. 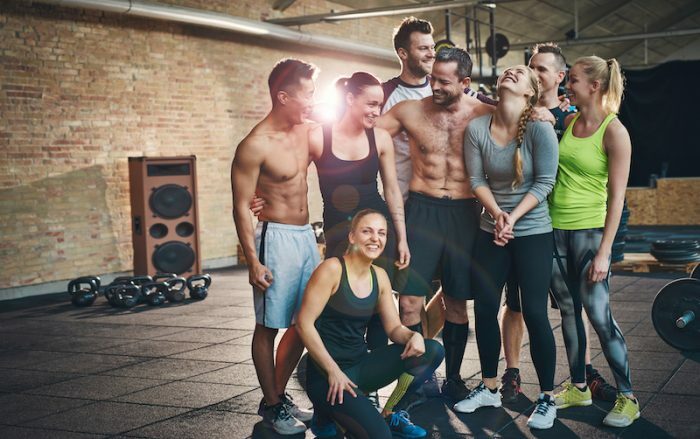 This will bring you extra joy and the power to reach even higher and push your limits – not to mention that it’s much more amusing to work out in a group than doing it alone. Group fitness sessions are a perfect way of making the first steps towards your long-term goals if you can do without the hassle. Your trainer usually creates lesson plans for these trainings by keeping an eye on the group’s needs and its limits as well. This way, clients can progress towards their goals on a steady trajectory, and they can also benefit from sharing the success of the others. It’s your goal as a trainer to be the guiding light for your students and show them how they should do each exercise. Instruct your group throughout the whole session and pay attention individual needs – but don’t forget that they have their limits as well. Help them out with certain exercises if it’s needed. Another task of the trainer is to create a clear and well-designed training plan for each session. Most trainings consist of warm-ups, main exercises and cool-down routines. The point of warming up is to boost your cardiovascular system and to loosen your muscles and joints. This way, students don’t have to worry about possible injuries. Cool-down routines lower your heart rate, and they also help muscles relax after a strenuous session. Do you want to stop having a chaotic, disorganised daily routine? Do you like if things are well organised and things just go the way they should be? Well – probably your clients feel the same way. Organising weekly group sessions and scheduling your own timetable both help creating a clutterless routine for trainers and clients alike. The following thing might help your clients out to be more organised: ask them to sign up for upcoming sessions in time and to comply with the timetable as much as they can. It might come as a surprise first, but this tiny piece of advice can help your clients organise their free time – not to mention that they will have time for things they’ve never dreamt before. Spomoco’s application can help you and your clients a great deal while organising your timetables. Its aim is to increase the efficiency of your weekly agenda and to help making bookings much smoother. Apart from all the above, Spomoco also constantly motivates your clients to keep on pushing their limits withouth missing out on a session. One of the greatest advantages of attending group sessions is the constant motivation your clients can get from their mates and you during each class. It just so happens that some people suddenly lose all the initial interest because of the lack of motivation. Fortunately, if they surround themselves with determined and motivated people, you can be sure that the group will keep their perseverance intact – there’ll always be someone to fire them up and keep that spark to keep on going. Group sessions help your clients get rid of all the excuses they used to have, and to get down to working out instead of flaking all the time. This way they can progress relentlessly, full with motivation towards their goals. Kick box, spinning, yoga, pilates – we could list them for hours and still not run out of them. If someone wants to start exercising, they’re truly spoilt for choice. They can browse through the list of the sports they like the most, and if they want, they can combine the different exercises. One can easily do an hour of yoga and another session of kick box during the same week if their agenda allows them to do so. This way you can also get to know more inspiring stories, which can further boost your clients’ motivation. Mutual respect, motivation and leisure. These are the cornerstones of everything. As you can see, group sessions have plenty of advantages compared individual classes. Most people choose to work out with groups because of the motivational force of having others next to them doing the same, and because of well structured, professionally built training plans prepared by you. Apart from this, you have to keep in mind that group sessions can be much more fun that individual trainings – they just help people detach a little from the dreary weekdays. How to take advantage of social media?